At the end of this week, I’ll have enough cash saved up to get my hands on one of two things I’ve wanted to buy as of late, a Playstation 3 or the Halo 3 Zune media player. Notice how I said one of the two back there. Now I have a dilemma. Which one do I choose? They’re both limited in supply and when they’re gone, they’re gone. In the following paragraphs, I’ll try to list the pros and cons of getting one versus the other. The Halo 3 Edition Zune is high on my “things to get” list due to the fact that, since my iPod crapped out on me two years ago, I don’t have a proper media player for listening to my favorite music while I’m away from my PC. To satisfy my need for music on the go, I’ve been using my PSP, PDA and, worst case scenario, my busted iPod (it still works on occasion if I screw with it). These are all decent for playing music and get the job done in a pinch (especially the PSP) but they’re hardly ideal. The PSP does score extra points for being a jack of all trades sort of system and handles music playing far better than my PDA or spastic iPod ever did but I can’t see it competing with the Zune because, despite the fact that I have a 4 GB memory stick in there, it’s being occupied by certain…user made applications and files that utilize the PSP in ways Sony never intended. So it’s pretty much out in terms of being a primary music player. It's not just the Zune itself that appeals to me either. 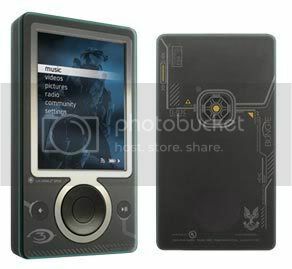 The Halo 3 Edition is the only version of the Zune I’ve ever been interested in. Why? Well, I’m extremely excited for Halo 3 and, well, I want to get this so I have a “well rounded Halo 3 experience”. I’m not the obsessive Halo 3 fan who is going to run out and buy the Legendary edition of Halo 3 and two of the new Halo 3 Edition controllers, the Halo 3 wireless headset and the Halo 3 Edition Xbox 360 or anything of the sort, but I like to collect some of the things that correspond with games I’m excited about. But there are some downsides to buying it now. The thing is $250, and that would take a huge chunk out of my funds, and it would be that much harder to save up for a PS3. The player itself has its share of downsides as well, due to its limited file support. To date, the Zune only supports WMV for video playback, MP3 and WMA for audio and JPEGs for viewing photos. This isn’t a problem for me since most of my music and pictures are in the required format anyway. The videos are the only thing I’d really have to worry about. I can’t forget about this one. If I make a move and buy the Zune without considering this first, I’m sure I’ll kick myself later on down the line. I’ve been considering buying one for quite some time now and because of the recent price cut, now is the best time to finally get my hands on one. There are several games coming down the pipe later this year and into the next that make me excited about the system and will validate my purchase and then some. I can’t bring myself to miss out on the likes of Metal Gear Solid 4, Heavenly Sword, Playstation Home and Gran Turismo 5. 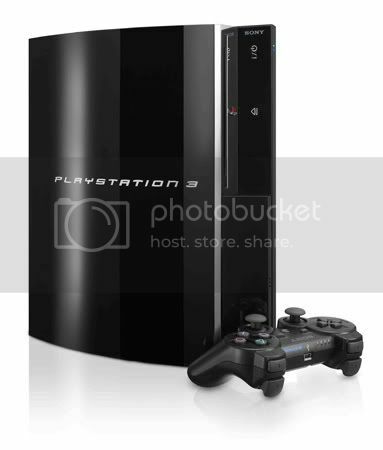 The PS3’s built in Blu Ray disc player is certainly enticing, as I’ll probably be making use of it in the future. The problem is, there’s nothing I’m really excited for on the PS3 that’s available now. The only games I really want to get for the system are Resistance: Fall of Man, Motorstorm and Ninja Gaiden Sigma. All the other games I’m interested on the system right now are multiplatform that I’ll probably end up getting on the Xbox 360 anyways. There are a few downloadable games I’m interested in such as the Gran Turismo HD Concept demo, Tekken: Dark Resurrection, and a few of the downloadable Playstation 1 titles. They’re all good reasons to buy a PS3 but not enough to justify the $500 purchase right now. That’s a lot of money. I didn’t even factor in all the other things I’d need such as games and accessories. I could recoup some of it by selling my PS2 on eBay but I doubt that would do much more besides cover the taxes and perhaps a game. But then again, I have to consider what I’m getting for my money. I’m getting a Blu Ray disc player, a high end gaming system, a media center, and a platform that will undoubtedly grow in functionality and usefulness as the years progress. For what you get in the system, $500 is really a steal. Now if only I could force my wallet to see it that way, I’d be alright. Okay, I thought writing all that would help me decide one way or another but it hasn’t. I’m still stuck between the two. Perhaps as pay day approaches, my mind will become clear, and I’ll be able to finally choose which of the two to get first. After about two weeks of being without it and going back to my older consoles to catch up on some classics that I missed out on, my Xbox 360 is finally back from the repair center. Sort of. When the UPS truck pulled up outside this past Friday, I rushed downstairs like a kid waking up on Christmas morning to greet the delivery man and receive my package. In a white box, almost exactly like the one I shipped it in was my Xbox 360. I rushed to the kitchen, grabbed a knife and opened it up. Immediately after opening it, I looked at the console inside and said to myself, “This isn’t my 360”. The letter I received in the package confirmed this. Instead of receiving my repaired Xbox 360, I have been sent a replacement unit. With the news of receiving a replacement, some worries began to develop. Does this mean I have another ticking time bomb on my hands? What of the reported upgrades the 360 has received recently, namely the second heat sink over the GPU? Does this mean my 360 doesn’t have this? I’ve noticed that my Xbox 360 does have at least one of the new enhancements newer models have received. The disc drive is noticeably quieter and seems to load games a bit quicker. Video quality seems to be a bit improved as well. I noticed that the opening movie that plays before the title screen in Forza Motorsport 2 is a bit smoother, lacking the minor compression artifacts I noticed when playing the game on my old 360. Despite my earlier worries, the system plays like a dream. Load times are a bit quicker, it runs quieter and of course, it plays some of my favorite games of the generation thus far. Earlier today, I checked out The Darkness and I’ve played an hour or two of it so far. I really like it so far. The Darkness powers really steal the show and are a blast to use (I’ve only really used the Creeping Darkness so far) and the gunplay is pretty good. It’s not up there with top tier shooters, but then again, I don’t think it was intended to be and as it is, it’s still very well crafted. I haven’t played the multiplayer (due to my lack of a real internet connection) but I’ve heard it’s nothing special, especially when compared to the single player mode.